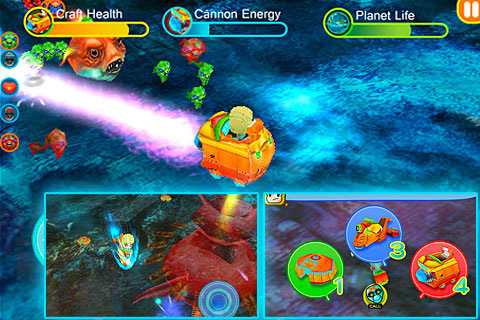 Captain BomBom is a 3-D gaming app that follows a fighter on his quest to save his planet from destruction. The game was released by Toropot Co. for an iPhone, iPod Touch, and iPad and costs $0.99. It is spring in the year 2269 and drills that drain energy supplies have invaded Captain BomBom’s planet, stirring him into action. Fortunately, he has an arsenal of creative and effective weapons to defend him against the hoards of different creatures protecting the drills. This is one of those games that is so detailed that I would recommend going through the brief tutorial before playing. To move Captain BomBom and make him shoot you use a joystick button. He gets three lives, which are in the shape of hearts, and he can always pick more up along his way but can only carry three at one time. Another thing BomBom is looking to pick up is a lightening rod that serves as a weapon recharger. BomBom gets three different Game Modes to choose from which are, Happy Boy, Brave Mortal, and Super Hero. BomBom gets to choose between lasers, landmines, and bombs to use in his attack. He can call in to his assistant once he has recharged for any of the three space vehicles. One of the crafts orbits BomBom and automatically shoots his enemies, and the other two he can fit into and shoot from there with the added protection and shooting range they offer. BomBom is somewhat psychic and whenever there are aliens enemies nearby advancing towards him he can see them on his radar before they enter the screen, which gives him the upper hand. At any time you can pause the game and play with the Options available, which include flipping the screen, moving around the joysticks, and turning the radar on and off. BomBom occasionally communicates with you to let you know what is on his mind, “Gee, they found me that quick, okay let’s fight”. 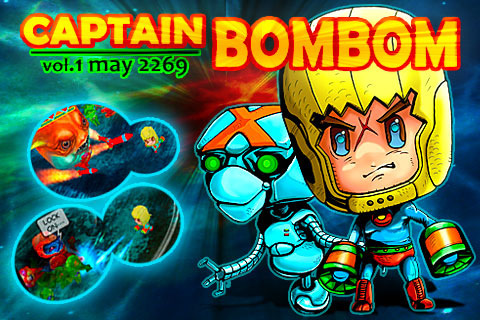 Captain BomBom is an entertaining and creative beat-em up game. As much ammo as you get, the game is still incredibly challenging as you get used to the coordination and timing that goes into successful playing. AppSafari review of Captain BomBom was written by Vanessa Paszterko on February 1st, 2011 and categorized under Action, Adventure, App Store, Beat-em Up, Fighter, Fun, Games. Page viewed 3895 times, 1 so far today. Need help on using these apps? Please read the Help Page.